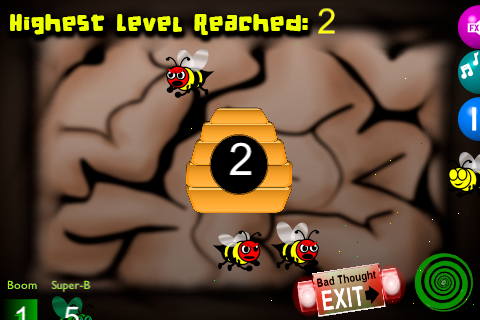 Exercise self-control by getting the bad thought bees (Red) out of your head, but make sure to keep the good thought bee (Yellow) in. There are power-ups in the lower left corner. Every time you get to a new level the hive will shrink down to its original size. If the hive gets too big, the game resets. See how long you can last. Watch out for the queen bee! She takes a lot longer to defeat. Hold her over the exit with your mouse to bring down her health. Click image to play. Does not work in Safari browser.